ROG Splitter Blend with possible boost in series rookie help needed? some of you could clear up a few rookie roadblocks I'm having trouble with. much volume to be had anyhow. ROG output to the boost input? so the 10uf's might need to stay. would it work as is in the schematics? Or better to also add decoupling to the LPB-1? Learning a little about that last part made me think of my Snark 9V adapter, and the daisy chain I've never used. to go between the daisy chains and the pedals (much like a 9v starve looks there)? Any knowledge or pointers would be greatly appreciated. Thanks! Re: ROG Splitter Blend with possible boost in series rookie help needed? Changing the 1M at the output for a pot will not give you more output. If you like to boost something before the send, you can modify one of the input buffers (or both) to a simple booster, something like an MXR Micro Amp. Or modify one of the buffers after the return, depending on what you'd like to accomplish exactly. I'd really rather add a boost like the LPB-1 at the end. so the 10uf's might need to stay." I would keep all three, and get rid of one of the 1M resistors. 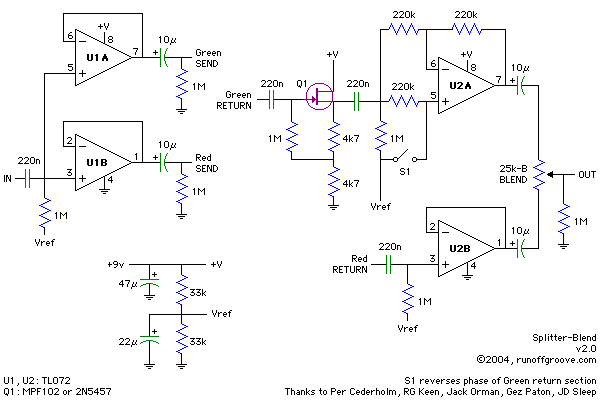 My guess is that the two 10uF caps are there to prevent the bias voltage of the two op-amp halves from interfering. And, you need the 100nF to keep a stable bias for the LPB1. In any case, that should work. It probably can be done more efficiently or beautifully, but I will leave that for someone more knowledgable than me .